It is 1840, and Jessie lives with his mother and sister in New Orleans, where he sometimes plays the fife to earn a few coins. One day, his playing is heard by a sailor who arranges to have him kidnapped and brought to a slave ship. Over the next four months, Jessie witnesses firsthand the horrors of the slave trade as he is forced to do the bidding of various members of the crew, and to dance the slaves. Jessie spends much of his time waiting to return home, but there are many hardships ahead before he will see New Orleans again. This 1974 Newbery Medal winner is quite a book. While it is not necessarily an enjoyable read, given the brutality of the way the slaves - and Jessie - are treated, it is really beautifully written. Author Paula Fox uses perfect comparisons and apt descriptions to round out each of the characters, even the minor ones, and she paints a clear, if disturbing, portrait of life on a slave ship. Since the story is written in first person, the reader has an eyewitness's point of view on everything that happens, and Jessie's anger, revulsion, fear, and yearning for home easily become the reader's own emotions, too. An especially effective feature of this book is the "History" page which appears before the start of the story proper. The information provided on this page includes the name of the ship and those of every crew member on board, as well as the number of slaves the ship carries, the date of its shipwreck, and the number of survivors - which is only two. Reading just this one short list piques the reader's interest by prompting lots of questions about the fate of the ship, and which two characters might be the survivors. For young readers who haven't learned much about slavery, this book does require some context. There is a lot of information about where slavery is and is not legal during this time period, which is a bit confusing, since it is almost all delivered through dialogue, and with little explanation. A map would also be useful to have on hand, as the route the ship takes is very straightforward at first, but it's hard to imagine without a visual aid where Jessie ends up after the shipwreck. 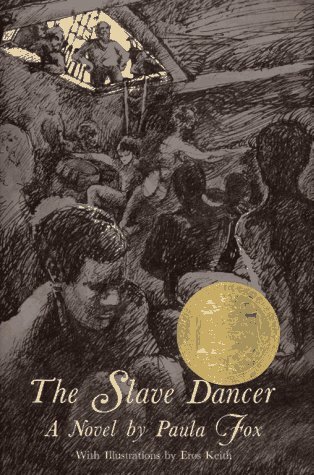 The Slave Dancer is definitely not a book to read for entertainment, but the beauty of the language and the importance of the subject matter make it a worthwhile read for upper elementary or middle school students studying slavery. Other historical fiction novels that are similar to this one in terms of theme and writing style include The Captive, Crispin: The Cross of Lead, and Weasel.